15 September - 16 December 2017. Touchstones Rochdale (Gallery Two) and Rochdale Interchange. Sutapa Biswas’ artworks are spatial stories that explore ideas and concepts of space and time. Drawing from literature, art history and oral narratives of people she has collaborated with in the early stages of making her art, Biswas’ pieces possess a poetic resonance with the human condition and everyday life. 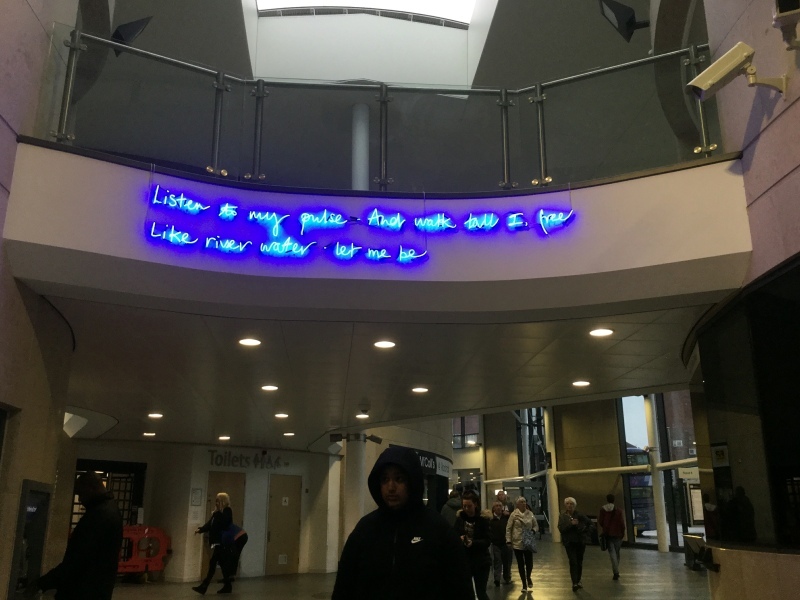 This new, major two part artwork comprises of, a neon public sculpture installed at the Rochdale Interchange and poem accompanied by a mixed media work as shown in Gallery 2. Biswas worked with a small number of South Asian men in recovery from substance use from the Rochdale area. This continues her interest in the untold oral narratives of different communities. Biswas’ new work explores the multi-layered complexity and lived experience of young lives spent in substance use and recovery. It includes testimony to growing up in a culture steeped in a colonial past, a continuing perpetuation of racism in Britain and conflicting concerns around the culture of masculinity. The importance of the mothers’ role in recovery became clear. Two of the men’s mothers’ names appear in the works’ title and subject, pay homage to this. In making this new work Biswas drew upon the Sufi poet and mystic, Rumi and the poem, Song of the Reed. “the place of the song…functions as an invocation of memory itself and the visceral space in which through voice, music and poetry we as humans connect and re-connect with ourselves from the past (our childhood and adolescence) to the present (adulthood)”. Important for Biswas is the neon works location. The public bus station a metaphor for the daily arterial journeying of people passing in and out and of recovery processes themselves. Chosen by Biswas the neon’s cobalt blue haze signifies an ethereal light often experienced in places of worship. 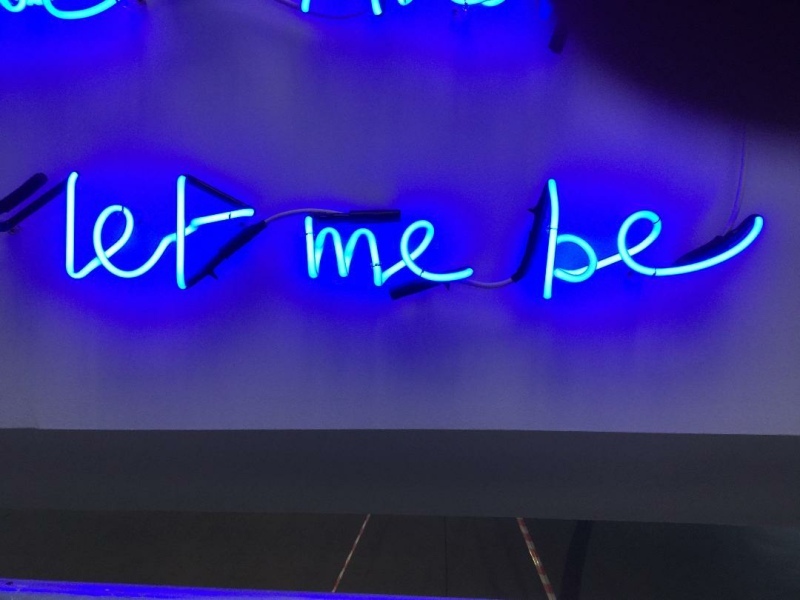 Biswas’ hopes that the neon prose work, the poem and installation at Touchstones, act as a kind of incantation for the viewer with the intention to liberate the spirit and to amplify the voices of the often unheard. Sutapa Biswas’ Out of place and at the margin – a hundred songs for Kneeze and Vijay is a Portraits of Recovery commission for Unseen: Simultaneous Realities. 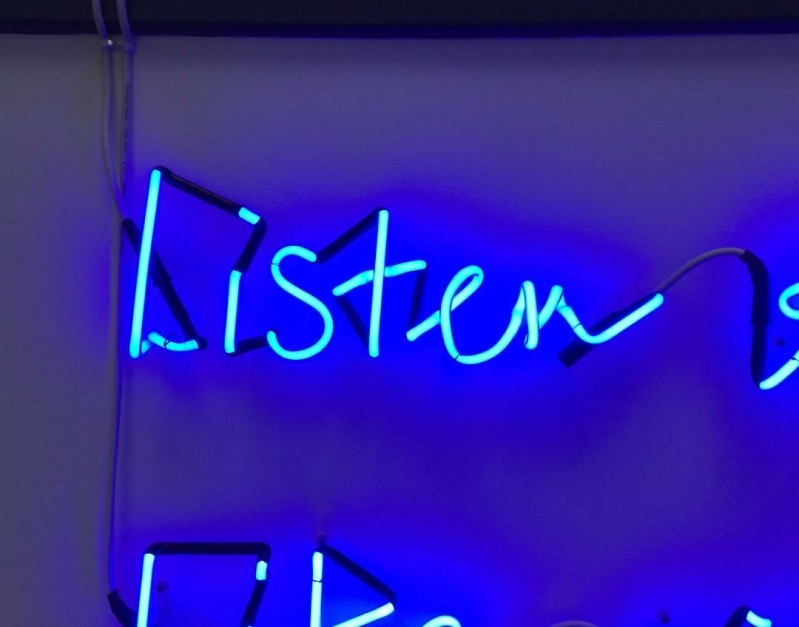 A programme of exhibitions, performances and events that explore the desire for Greater Manchester, LGBT+, Disability and South Asian recovery communities to become more visible and better understood. UNSEEN is curated by Mark Prest, founding director of PORe and delivered in collaboration with the project academic lead, Professor Amanda Ravetz from the Manchester School of Art at MMU. Image: Sutapa Biswas,Out of the place & at the margin: one hundred songs for Kneeze & Vijay, 2017. Installation view - Rochdale Interchange. Courtesy the artist. Image: Sutapa Biswas, Out of the place & at the margin: one hundred songs for Kneeze & Vijay, 2017 (detail). Courtesy the artist.